Chicha de Jora had been on my list of drinkable liquids to try. I became enamored with the drink after interviewing Monica Szepesy, owner of Q’ero Restaurant in Encinitas, Calif. for an article two years ago. Read it here. The food at Q’ero is to-die-for and, in my world, food with cred begins with restaurateurs with cred. Szepesy travels to Peru each year to purchase spices she can’t find locally, yielding mouthwatering South American dishes found nowhere else in San Diego. Sure, there are the salteñas (divine!) and a crave-worthy starter salad Italian showering in a stunning citrus vinaigrette, but the kicker is Szepesy and her staff’s use of chicha de jora, a corn-derived, fermented alcoholic beverage. She can’t sell it for drinking purposes, she says, but her culinary comrades toil to make it just so they can braise their meats to tender goodness. The result: dishes like Bistek a la Trujillana: Grilled Brandt Ranch (my fave beef) skirt steak with a caramelized onion, aji amarillo and chicha de jora sauce, served over roasted sweet potatoes with sautéed Swiss chard. She says that people living in the Andes who brew and sell chicha let travelers know by raising a flag above their home. Who wants to trek with me to Peru? The non-alcoholic version of chicha de jora is chicha morada, served at my other favorite Peruvian place, Cafe Secret in Del Mar, where a forward Peruvian elder recently stopped my friend Nicole Darling and me to emphasize how legitimate Cafe Secret is (when I mentioned Q’ero, he gave it a resounding nod of approval, too). The pork chicharron sandwich at Cafe Secret is so delicious it overpowers my dreams and I rarely drink with my meals (digestive hazard and all), but I make an exception here from time to time with a glass (ask for light ice) of chicha morada. 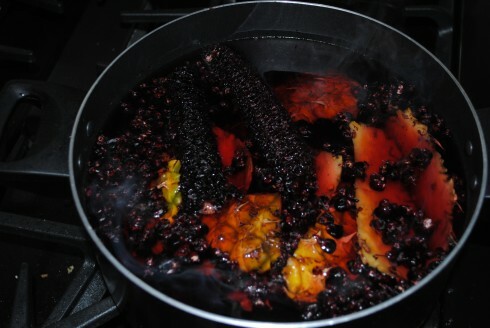 My zany beer writer friend, Em Hutto, who you must follow on twitter (@emilyhutto), asked me to share her recipe for chicha morada, adapted from Limo Restaurant in Portland, Ore., with you all. So, here it is. If you make a batch, let us know how it turns out! Wash and skin the pineapple. Reserve the skin. Twist the kernels of corn off the cobs and place in a bowl. This will make the color of the mixture more intense. Boil the cobs and corn with the pineapple skin in a gallon of water. Consider adding apples, the fruit of the pineapple and/or pears. Boil until the corn is soft and about to pop. The liquid will look muddy. Let cool to a warm temperature. Add the sugar slowly so you can decide how sweet you want it to be. Mix in juice and zest from limes. Serve or freeze in ice cube trays to preserve for later.